Walhydra doesn’t like to acknowledge her East Coast liberal condescension toward the popular gullibility of “the masses,” especially their love-hate relationship with celebrity and their gleeful embrace of “miracles” which claim to trump science. She and hubby Jim have not had a television since 1992, shortly after the now-departed Miso the Cat came into their lives. This means that they learn about news and culture the old fashioned way, through the newspaper and the radio. And...by browsing the tabloid covers at the grocery checkout. One of their favorite games is to count how many different covers show Brad, Angelina, Jennifer and Company in how many contradictory combinations of adoption, jealous spat, breakup, secret meeting, ecstatic reconciliation, etc. Given her myopic view of the world, Walhydra was delighted to have her eyes opened a bit by Elizabeth Svoboda’s recent New York Times article about University of Bremen neuroscientist Doris Tsao’s research. Intrigued by how readily people will claim to see “faces” given the right configuration of light and dark areas, Dr. Tsao eventually discovered three regions of the temporal lobe in macaque monkeys which fire at the slightest glimpse of such a configuration. Of course, Walhydra was also fascinated, and she plunged immediately into an extensive Google search. She quickly found the term pareidolia, referring to the misperception of vague and random stimuli as recognizable. As Dr. Tsao’s research confirms, we have a “hardwired” survival technique enabling us to recognize faces from a distance with poor visibility—but this wiring also “sees” what isn’t there. Or so the scientists claim, say Walhydra’s skeptical masses. For every space probe photograph revealing the natural structure of the Cydonian “face” on Mars, there is a True Believer who can prove that it is actually artificial. All of which brings us back to Walhydra’s condescension and subsequent enlightenment. What mainly caught her eye in the Times article was the picture of Diana Duyser’s grilled cheese sandwich. After keeping this sandwich in a reliquary for ten years—during which time she insists it got neither moldy nor crumbly and brought her miraculous blessings—Mrs. Duyser sold it on eBay for $28,000. Definitely a miraculous blessing. And why all the attention? 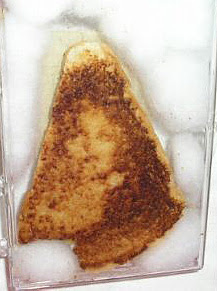 Because you can see the face of the Virgin Mary on the toast. Walhydra sees it too. Or, rather, some cells in her temporal lobe fire because a certain configuration of light and shadow matches the hardwired primate pattern for recognizing a face. So, this is a case of religious pareidolia. A Catholic woman seeing the Virgin Mary, where a Muslim might see the name of Allah or a verse from the Qur’an, written in Arabic script. But, um.... Walhydra furls her eyebrows. Could it be, then, that Mrs. Duyser’s reaction to the toast means she had already experienced Mary as the personification of divine feminine benevolence and compassion breaking into her life? Sort of like the Tibetan Buddhists’ acknowledgement of Green Tara, who refused to become a bodhisattva until she could do so in female form, and who then returned to bless the world, as she does to this day. Maybe Mrs. Duyser came to her lunch already imbued with a trust in and longing for Divine Presence, and her temporal lobe—and the toaster—just did the rest. That gets Walhydra to wondering, a bit ruefully: How does one move from scorn for the credulous to a working, sustaining faith for oneself? Increasingly as she approaches—eek!—sixty, Walhydra finds herself suddenly awake at 2:30, 3:30, 4:30 in the morning. Wide awake, with “monkey mind” jabbering away, listing off and analyzing all the problems ahead. How to provide long distance care and safety for her Mom, Senior Witch? How to trust her knowledge that, beneath their well-guarded father-and-son barriers (“After all, boys will be boys”), she and her Dad, the Lutheran pastor, live in the same land of the heart? How to sustain hubby Jim’s career hopes, when the alpha male-driven winds of academic bureaucracy may be forcing them to move again. How to get the code on that library web page to put the pop-up menu where she wants it? For her first thirty years, Walhydra alternated between her favorite pastime of despair and her search for the right combination of outer world rituals and magical thinking. Hoping to find the perfect grilled cheese sandwich. And at some point, amidst the monkey chatter, glimpses the right combination of dark and light patterns to remind her of a face which no one can see and no one can name adequately. “Walk in this moment throughout the day. “Everything else is in your mind. Memories of what’s happened. Imaginings of what you hope or fear will happen. Struggles to control and reshape both. “It’s just monkey mind, doing its hardwired job of trying to survive in the jungle. “But you don’t have to give it all of your attention all of the time. After all, it’s had millions of years of practice. “So just be in the present moment. It’s the only place your awareness can actually be. Walhydra grins silently. She bows, rises to her feet—much lighter than when she sat down—and stands before her Jesus/Buddha altar. Amused at the horror of her Lutheran ancestors—not to mention a number of Pagan, Quaker and Humanist friends—Walhydra giggles as she feels her right hand lift to the ceiling on its own, in good Pentacostal style, to send this blesséd energy back to the Source who has graciously shared it with her.